A few days ago I got a call from a friend suggesting that we go to see the recently discovered Anglo-Saxon gold, now on temporary display at Birmingham Art Gallery. Good idea I thought. Maybe 30 minutes in the queue, and then into the museum. Boy, was I wrong! After standing in the queue for about 20 minutes a woman with a megaphone appeared. She proceeded to advise via the loud hailer that we were in for a 2 hour wait. She also told us that progress into the museum had been slowed down by a medical emergency further up the line. Well, if it had been an hour, I might have stuck it out- but 2 hours? No way. I hate queues and crowds at exhibitions anyway. Yes, it’s the common rant of the art historian who is privileged to enjoy exhibitions at private views, art history conferences or on study trips to rarefied print rooms. 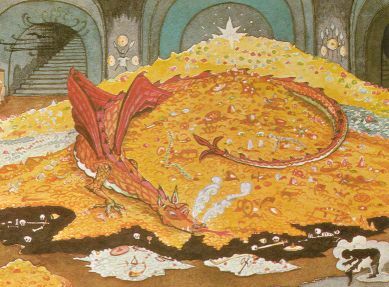 If I had to queue for 2 hours, I would expect to see the golden treasure of Smaug the dragon- in the Hobbit- or the gold of the Rhine maidens. Anglo-Saxon treasure trove might have its attractions, but it wouldn’t convince me to stand in a queue for that long. The show only lasts for another week and a half, before transferring to the British Museum. I might have another go next week, so long as the gold rush has died down. But somehow I doubt it will. In fact I later learned from my friend that he had had to wait for 3 hours, a delay caused by the arrival of the Lord Mayor who had decided to visit that day. My friend reported that it didn't look like gold, and there wasn't much on show. Not really the holy grail then. All things considered, I think I made the right decision to bail out.